Spring has finally sprung! The warmer temperatures make way for the Spring Festival, as our friend Eggbert returns to the Shopping District in Wizard101, with his usual Spring goodies. 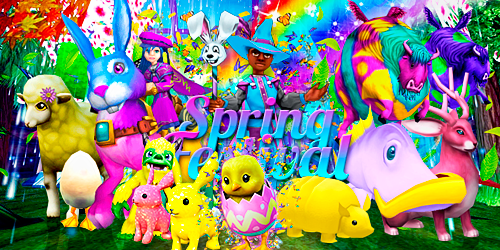 The Bunny Costume, the Egg Pet and the Spring Hare Mounts are also back in the Crown Shop! In Pirate101, you have many pets to choose from: the adorable Spring Yeti, sweet and sugary pets like the Pink Marshadillows, Chocolopes, and Eggaloons. Of course, don't forget about the Spring Leaf Eyepatch to complete your Pirate's springy look! Wizards can now adopt the new Spring Chicken Pet, and Pirates can have the adorable new Cyan Marshadillow Pet by their side! A brand new, permanent mount is also available in both games: the Butterfly Swarm Mount! The Stormrider Hare is also making its comeback! 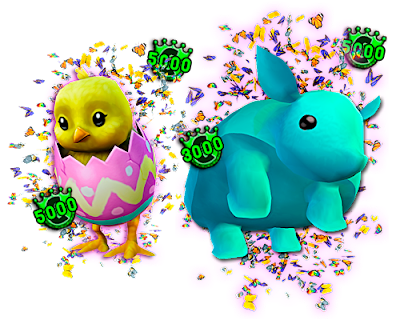 This special mount can be obtained as a reward from duels, but only during Easter festivities and only from bosses that are level-appropriate to the Wizard. Read Prospector Zeke's post to know which bosses to farm at your current level. The Eggshellfish have returned for the Spring Festival: Black Eggshellfish (Death), Blue Eggshellfish (Life) and Yellow Eggshellfish (Myth). The Cold Cod has left the Spiral waters, and the Springfish has returned to replace it! This Storm Fish swims in the waters of all worlds, where fishing is allowed. For a complete list of locations, check the Fishing Database.